Leveraging on our skilled and qualified professionals, we are actively involved in offering a trendy range of Fancy Women Necklace to our valuable customers at pocket-friendly prices. 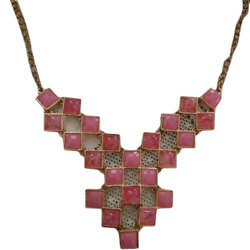 We are specialized in offering Designer Necklaces Set to our customers. Our presented product is extremely used in the market owing to their top features. Amercan Diamond Necklace Set: 1 Necklace, 2 Earrings, 1 Maang Teeka. 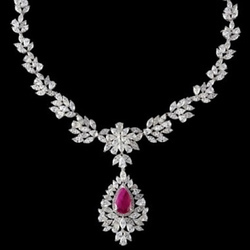 The set is articulated with Pearl and Ruby Stones which will just look immaculate on your special occasion. We offer an exquisite White Shell Artificial Necklace which is designed to perfection by our jewelry experts. Our collection of necklaces is available in contemporary designs and patterns that suit the taste of our clients. Shree Tirupati Gems And Jewels Pvt. Ltd.